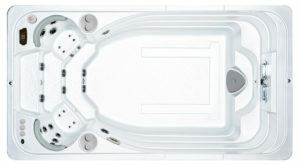 Hydropool Swim Spas are built to stand the test of time and offer an industry-leading guarantee package. Hydropool is one of the largest Swim Spa manufacturers in the world and is committed to building superior Swim Spas utilizing the latest technologies, with the latest environmental practices. Our research and development team is always striving to be at the leading edge of innovation and design. They meet or exceed all international standards. 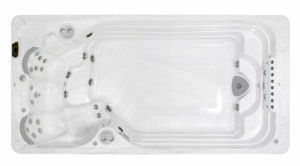 Their unique Self-Cleaning and Double Thermal Shield systems enable them to meet the rigorous energy efficiency standards set out by the California Energy Commission (CEC) and are the world’s first CEC-approved Swim Spa manufacturer. A Company you can trust, they stand behind every Hydropool Swim Spa manufactured since their creation. For thirty years, they have been dedicated to customer service excellence. When you're experiencing the Self-Cleaning technology found in Hyrdopool’s Self-Cleaning Swim Spas, you can rest assured knowing that their products leave you with clean, pure water that is 100% filtered and backed by their Safe Water Guarantee.